You’re not sure what’s gotten into your little girl lately. All she’s been asking for is grits and sweet tea for breakfast, and she moves her rocking chair from room to room, just sitting and fanning herself, pretending she’s out on a porch, surveying the townspeople as they go about their business. Sounds like you have a real Southern sweetie on your hands. Never mind that you live in Michigan and it’s already snowing there. If your gal wants to bake a pie and practice good posture, you’re not going to stop her, are you? It’s safe to say, then, that your little lady will sweeten like a peach at the sight of this Southern Belle Kids Costume. 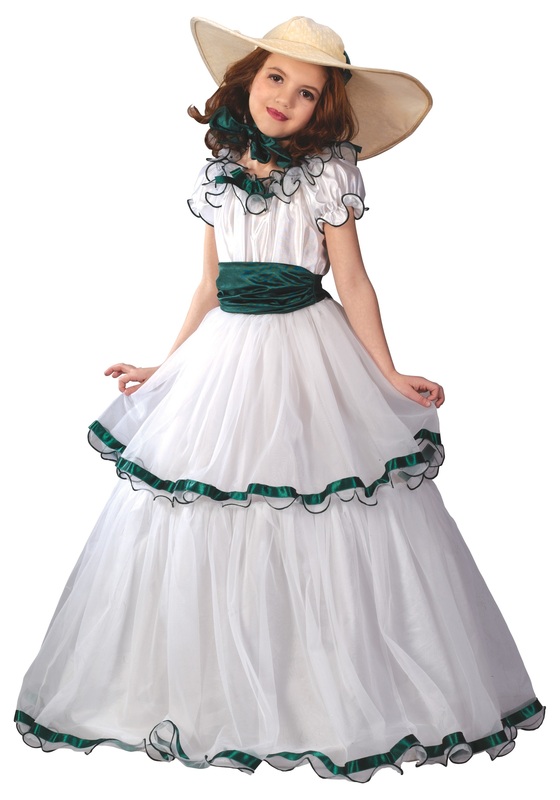 Any little girl who loves to get pretty and all dressed up will love wearing this costume, but your girl, in particular, will look wistfully at the ruffled layers and emerald trim of this gorgeous gown. It has not one but two built in hoops for extra volume that really says “society girl” and the large hat ties under the chin to complete the whole dainty costume. She may be about five states away from where she feels she truly belongs, but in this elegant ensemble, your girl can feel the hot muggy air of her heart’s homeland blowing through the breezes. Pick her up a delicate fan and a few jugs of sweet tea--once summer comes, you’ll know exactly where to find her, rocking away in the sun!